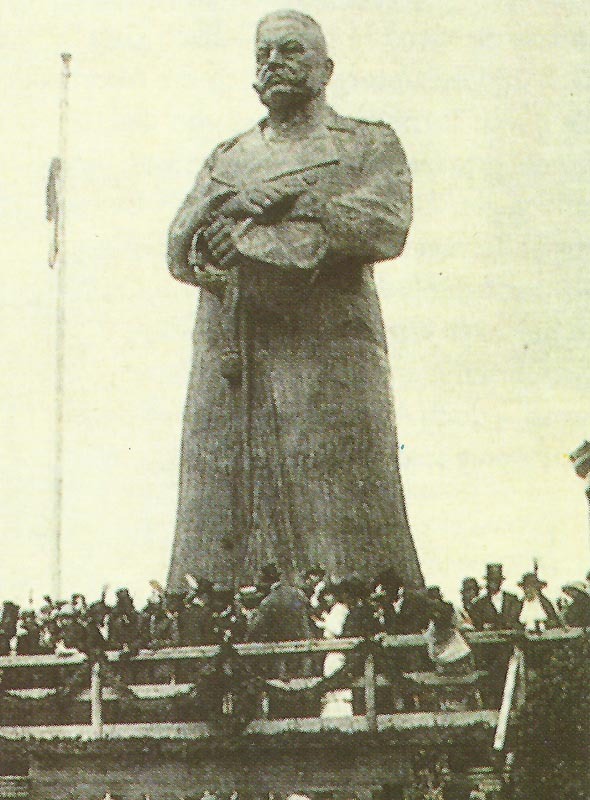 Still during the war, this imposing statue is erected in honor of Hindenburg in Berlin. Reception at German GHQ (Kovno) to mark Hindenburg’s 50 years military service. Tsar inspects Ninth Army at Kamenets-Podolsk, meeting Brusilov there (until April 10). Britain: CIGS (Chief of Imperial General Staff) cables HMG’s (His Majesty’s Government) approval of Anglo-French summer offensive. Western Desert: British armoured cars raid Moraisa (18 miles northwest of Sollum); 2 German radios, 287,000 cartridges and some rifles captured. Italian Front: Future top Italian ace Baracca scores first victory, an Austrian Aviatik forced down near Gorizia (Isonzo). Germany: Bethmann replies to Asquith: German food prospects good; Allies refused to consider peace in September 1915; Central Powers will settle Polish question. Britain: Sheffield Exhibition of enemies former imports (­until April 13).